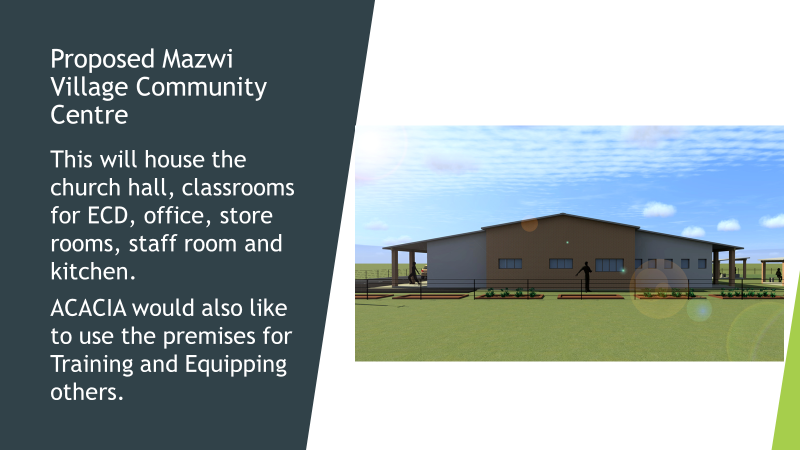 We at JIBC are excited about a project we are undertaking for our missionaries, Graham and Sarah, who are working with the charity Acacia (Assisting Communities And Children In Africa) in Mazwi Village, Zimbabwe. 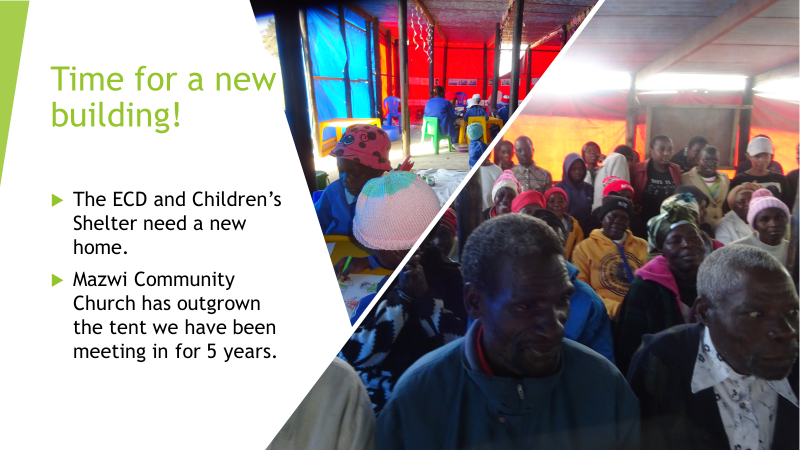 Graham and Sarah visited us a few weeks ago and shared a vision they have from God for Mazwi Village and that is to see a building project come to fruition. Pastor Steve felt, as they shared with us one Sunday morning, that God was prompting us to help this happen………..as we sit in our comfortable chairs Mazwi people do not, as we have a lovely building to worship in Mazwi people do not (they meet in structures made with wooden poles and tarpaulin), as we have toilets Mazwi people do not, as we have health care at our finger tips Mazwi people do not. They have several mamma’s who are HIV positive and have a days journey each month to pick up their life saving medications (all of whom are sponsored). As you can imagine there are lots of other health issues that would really benefit from a clinic, which will be included in the new building. They have children of all ages who go to school because of a sponsorship programme. So, the project is to build a multi-purpose building which will include a church hall, classrooms, toilets and the clinic. 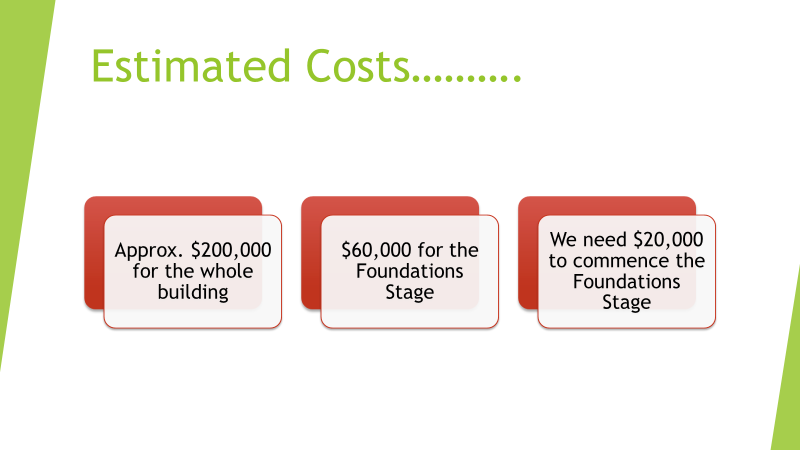 Graham and Sarah have plans for this but no finance, so we at JIBC are looking to help them with this. We are praying for God’s blessing on the project and planning a special gift day in October plus charity events that will help us raise funds. We plan to keep this at the forefront of our minds, prayers and actions over the next year. The project is called JAMMY (Javea Acacia Mazwi Mission Year). That God will bless this project. That we would see sacrificial giving on the gift day. That other churches might be fired up to join us in this project. That Graham and Sarah would be blessed in all their works in Mazwi village and that they would see God moving this project on. For continued good health for Graham as he was unwell when he came to us, he is improving but still needs to be upheld before the Lord. There are lots of pictures of Mazwi village on Acacia’s Facebook page so please look them up. They have just completed a building project to have their own grinding mill, which we believe is a gift from God. It means they can now grind their own maize instead of journeying for a day to get it done. There are lots of things that cannot be mentioned on Facebook regarding Faith because of the sensitivity of the Government of Zimbabwe. But we know God is moving in a mighty way through Graham and Sarah………He can do immeasurably more than we could ever ask or imagine. Thank you in advance for your interest in this project and our prayer is that God would move you to join us in prayer and perhaps in giving to this so deserving a cause. ​Digging trenches for the foundations this morning! Parents of the children and Church praying and singing on the land !